The Electoral College was clearly an unholy if necessary compromise with slavery. Even following the Civil War, the Electoral College crisis of 1876 helped perpetuate racial injustice by ending Reconstruction, which led to another century of racial subjugation. [Under the national popular vote], candidates will seek votes wherever the voters are. They will not ignore 100 million voters — urban or rural. They will use technology to reach as many voters as possible as efficiently as possible. That feels like democracy — the kind of democratic republic James Madison would have approved. What does Fixing a Bicycle have to do with Fixing our Destructive Presidential Election System? To a striking degree, voters of different political persuasions agree that things are going wrong with our government and our political system. Shared national values are fraying as a result. Most voters agree on many of the things that are going wrong—hyper-partisanship, citizen distrust of government, intensive divisiveness, and a conviction that they are not being represented by the system. To be sure, they don't agree on how to reform the system, but fundamentally they do agree that it needs to be reformed. When I was a kid growing up during World War II, the popular story line was that Americans were good at fixing things. When GIs landed in rural France they endeared themselves to the liberated villagers not only by handing out chocolates but also by repairing their bicycles. To fix a bicycle, one first needs to determine what is wrong with it and then roll up his or her sleeves to make the fix. That was the reputation Americans had, it was legitimately earned, and we were proud of it. The same was true of our political system from the earliest days of our country. We did what we needed to make things work. Our founders were visionaries, it is true, but they were also practical. Europeans, by contrast, tended to be guided by ideologies and spent considerable time in ideological debate. This approach—from the divine right of kings, to the perfectibility of humankind, to communism's "from each according to his ability, to each according to his need," to the empty and cynical slogans of totalitarian states—got them into trouble. In contrast, American political rallying cries—Teddy Roosevelt's "Square Deal," Franklin Roosevelt's "New Deal," and Harry Truman's "Fair Deal"—have been grounded in the practical mentality of the Yankee peddler. In addition to improvisation and practicality, these slogans reflected a commitment to fixing things, making them better. As a country, we need to fix our political system, and it doesn't matter all that much, beyond certain fundamental values the great majority of Americans share, what collection of beliefs each participant brings to a table where the root causes of our problem are identified and remedies are fashioned by collaborative discussion and reciprocal horse trading. Making Every Vote Count's leadership has come together from different political perspectives. Like a rapidly growing number of other groups and individuals, which are concerned about the serious problems in our political system, board members of disparate views on many issues are joined in the conviction that a major source of these problems is a very specific segment of our Presidential election system -- how 48 states allocate their electoral college votes under a very unrepresentative winner-take-all system -- not in the Constitution, itself, and that it is fixable. This defect is the equivalent of the broken bicycle chain that prevents it from being used properly. So, let's put aside ideologies, but not our national values, put our hands into the grease of the malfunctioning bicycle chain and devise and implement the needed fix. That's what our founders did in 1787, when the damaging flaws of the Articles of Confederation had become apparent. The difference here, however, is that we don't have to throw away the old bike. We need to fix only the one defective part of it. In the case of our Presidential election system, an increasing number of commentators, scholars, and public and political figures recognize that the appropriate remedy can and should be implemented at the state level, not at the level of the federal government. We should get on with the job. This article by Yale Law School Professor Akhil Reed Amar has it right. The Electoral College is not something to be venerated. It is a shame that the framers had to adopt this system to get the necessary votes from slave states to ratify the constitution. It’s a further shame that it has existed for the last two centuries plus. The reasons sadly have a great deal to do with the fact that the history of America is the history of race. We don’t need to have a constitutional amendment to extirpate this system from the future of America. Just appointing a big enough bunch of electors who are bound to the national popular vote winner will be sufficient to cause campaigns to compete nationally. Then this particular element of national disgrace will be erased. The part Professor Amar has wrong is his unsupported statement that there are reasons to keep the electoral college system. He does not cite any. There aren’t any. The Week debunks several of the most prominent arguments against the National Popular Vote, including that the current system is working the way the Founder Fathers envisioned, that candidates would ignore small states, and that change is impossible. Take a look at this illuminating history of the Electoral College from Making Every Vote Count Co-Founder and CEO Reed Hundt on Medium. It discusses how the Electoral College was conceived to protect the institution of slavery, and how the Electoral College worked to create and preserve Jim Crow long after slavery was officially abolished. 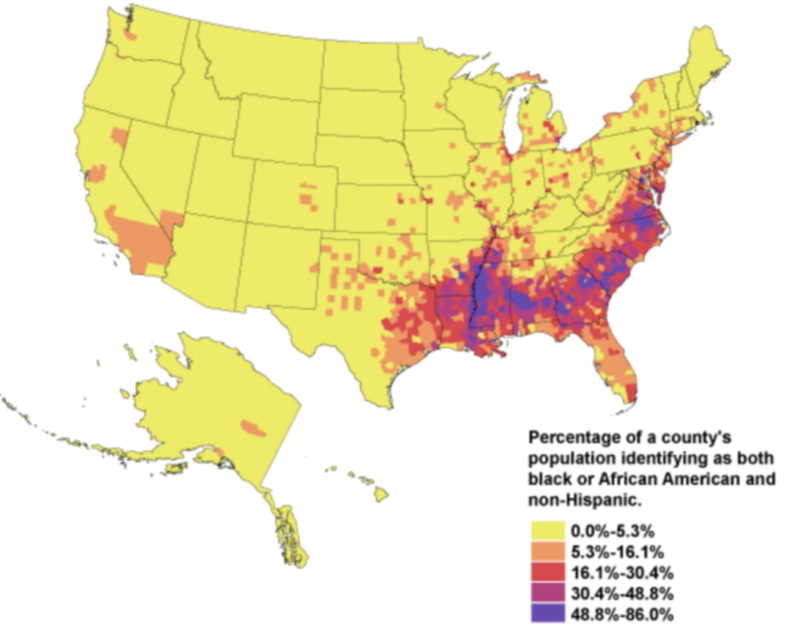 In “No Property in Man,” historian Sean Wilentz explains that the southern representatives to the constitutional convention were disappointed to see rather quickly that the “widely expected movement of population to favor the south and southwest never occurred, as settlement of migrants and new immigrants disproportionately favored the North.” Page 187. In 1800, free states had 76 members of Congress, and slave states had 65. But by 1820 the margin was 122 to 90. Southerners had hoped that the three-fifths compromise coupled with a swelling slave population would give them a slaveholding majority in the House. In that event, the Electoral College would always produce a pro-slavery president, even while slaves could not vote. But demography is destiny. The burgeoning population of the North rapidly gave the House more free state representatives despite the three-fifths compromise. Now again, as in first decades of the Republic, the demographic trends of the country are rapidly filling the House with members who root out and oppose racism in all its many manifestations, whether blatant or insidious. These same trends have not yet changed the method of selecting the president. This is the reason that racially divisive candidacies for that high office are still possible. Someone asked me the other day what I most disliked about the Electoral College system (that any state law can change). Huge is the fact that the system virtually forces the candidates to ignore the views of the vast majority of Americans. But here's the whole list of what disturbs your correspondent. 1. Makes the views of most Americans irrelevant to presidential candidates. The Electoral College system creates swing states—they are accidents of demography, states where the balance of right and left leaning voters by happenstance is roughly equal. Most state populations tilt one way or the other. These are the ignored states, because the candidates know who will win the plurality. But more than 80% of Americans live in the land of the ignored. There strong majorities support more government action on infrastructure, shift to clean power, limitations of the size of magazines in assault weapons, the well-off paying a higher percentage of their income in taxes than the middle to lower income households, more government support of higher education so college doesn't cost an arm and a leg, and immigration reform to give clarity to millions of people about whether they can or cannot ever become citizens. The Electoral College system motivates the candidates to appeal to the views of the few and ignore the wishes of the many. 2. Bad for Black Americans. The framers of the Constitution designed the Electoral College to make sure that no abolitionist could become president. When Lincoln got elected in 1860, and the civil war ensued, in the aftermath the former Confederate states in the south adapted the system to make sure that all electors from their state represented white supremacists and no former slaves could ever send an elector to choose the president. To this very day that same system suppresses the relevance of African American votes in almost every election. This is why Barack Obama got zero electors from South Carolina to Texas—right across the heartland of the old Confederacy. 3. Unfair to women. The Electoral College is biased against women. More women vote than men. Women turned out a bigger majority for their preferred candidate than men did for theirs. But somehow the choice of males got elected in 2016 and 2000. Why? The Electoral College made the election turn not on the views of the whole country but only on the skinny margins of a handful of states where the views of women were felt a little less strongly than in the whole country. 4. Treats legal immigrants as second class citizens. The Electoral College is biased against immigrant citizens even to the second generation. Most immigrants live in just five states—the states that are portals to the country. In all these five except Florida the candidates of both parties take the election results for granted, and so they ignore the wishes of immigrants. And in Florida the immigrants who matter most matter are Spanish speakers not from Mexico. No candidate could campaign about a wall or rail against immigration except for the unfairness of the Electoral College. 5. Throws shade on workers. The Electoral College is biased against workers who hold jobs located mostly in the 40 states that are taken for granted. Loggers and longshoremen for example are ignored while coal miners get lots of attention. Why? Coal miners live in swing states. The others don't. This unfairness exists only because every vote does not matter—hardly any votes matter except those in swing states. The Electoral College "Has Not Stood The Test Of Time"
The history of the Electoral College from [1800 on] is of Americans working around the institution, grafting majoritarian norms and procedures onto the political process and hoping, every four years, for a sensible outcome. And on an almost regular schedule, it has done just the opposite. Americans worried about disadvantaging small states and rural areas in presidential elections should consider how our current system gives presidential candidates few reasons to campaign in states where the outcome is a foregone conclusion. For example, more people live in rural counties in California, New York and Illinois that are solidly red than live in Wyoming, Montana, Alaska and the Dakotas, which haven’t voted for a Democratic presidential candidate in decades. In a national contest for votes, Republicans have every reason to mobilize and build turnout in these areas. But in a fight for states, these rural minorities are irrelevant. The same is true of blue cities in red states, where Democratic votes are essentially wasted. Candidates would campaign everywhere they might win votes, the way politicians already do in statewide races. Political parties would seek out supporters regardless of region. A Republican might seek votes in New England (more than a million Massachusetts voters backed Donald Trump in 2016) while a Democrat might do the same in the Deep South (twice as many people voted for Hillary Clinton in Louisiana as in New Mexico). This, in turn, might give nonvoters a reason to care about the process since in a truly national election, votes count. In this video, Professor Richard Tedlow gives a fascinating history lesson on how and why the Electoral College came into existence. Professor Tedlow explains the Electoral College, as it currently operates, is out of line with what the Founders envisioned and what most Americans want. He discusses the practical obstacles to holding a popular election at a time when transportation and communication infrastructure was so poor as well as the compromises necessary to get slave states to agree to the new Constitution. He dispels a few common myths about the Electoral College, including that it’s working the way our Founding Fathers intended and that it protects small states. Professor Tedlow also explains that we are not stuck with our current system, and we don’t need a constitutional amendment to make the changes we need. Democrats use a proportional system to nominate their candidate for president. Proportional systems were favored by “early twentieth-century progressive reformers who saw proportional representation as a way to break the power of big-city political machines.” Proportionality was revived by Democrats in their presidential nominating process in the wake of the divisive 1968 nominating experience. The result is that Democrats typically attract more attention, more voters register Democratic, Democrats build a big tent and a big base, and Republicans hope that greater control by an elite over the process gives them a candidate who aligns with the wishes of the elite. In 2015-16 the winner-take-all system greatly helped Donald Trump’s take-over of the Republican party. If the Republicans had used proportionality to choose delegates, Trump would have had a much more difficult time getting so many delegates so early. He might well have won the nomination anyhow, but the theory of an elite controlling the process is now debunked. By contrast, while using the equitable proportional system almost exclusively since the 1990s, the Democrats have nominated candidates who won the national popular plurality in every general election from 1992 to 2016, with the sole exception of 2004. That is six wins out of seven. One person, one vote builds a bigger, better, reliable base for a national party. Here is look at the debates that gave rise to the Electoral College, and how the southern states’ desire to preserve slavery was a driving factor behind our current system (from the Milwaukee Independent). This big margin concealed numerous close statewide races. Labelling a state as a swing state if the popular margin statewide was 3% or less, we see that Kennedy won these swing states: Delaware, Hawaii, Illinois, Michigan, Minnesota, Missouri, Nevada, New Jersey, Texas, New Mexico, Pennsylvania, and South Carolina. 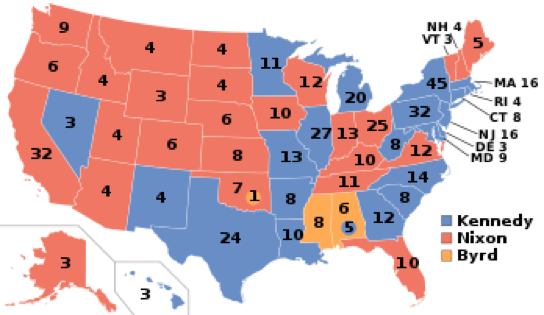 Nixon won these swing states: Alaska, California, Florida, Montana, and Washington. Obviously there were so many swing states that the election felt like a national election. Moreover, the swing states were so different demographically that the candidates each had to appeal to big, complex coalitions of factions in order to prevail. The Electoral College system did not appear to contribute to divisiveness, despite the extreme closeness of the outcomes in so many states and the indicative if meaningless closeness of the national popular vote. Obscured somewhat by Kennedy’s large electoral victory was the untenable nature of the Democrats’ Electoral College block. Kennedy won New York, the state with the most electors at 45, by a 5% margin. This result marked a giant reversal from Eisenhower’s victory there in 1956 with 60% of the votes. The Democratic coalition in urban and suburban areas was racially, ethnically and religiously mixed. This coalition plainly was the base for Democrats to depend upon in future elections, given population gains in the former free states. Its composition, however, differed radically with the party’s southern base, from where 81 Kennedy electors came. That explained Lyndon Johnson’s presence on the ticket. But it foreshadowed the Republican choice to align its party with white voters in the south while relinquishing its historic Lincolnian alignment with African-Americans. New York’s results in 1960 taught the Republicans to look south for winning in the future. By 1968 Nixon’s southern strategy was in place. With the popular vote virtually evenly divided, the parties could have taken different paths toward political victory if the national popular vote selected the president. The Electoral College system, however, made the southern electors, chosen almost exclusively by white votes, so critical that the Republican Party could not resist reshaping its policies, programs, and promises to take the pluralities in these states. The divisiveness of American politics today stems not from the popular vote in 1960 and thereafter, but instead from the pernicious electoral system. "The Christian nationalist movement today is authoritarian, paranoid and patriarchal at its core. They aren’t fighting a culture war. They’re making a direct attack on democracy itself." The American experiment is and always has been a "direct attack" on a king, on the idea of kings, on the notion that kings should rule and the people should not. The American Revolution, the Civil War, the War to End All Wars, the triumph of the United States against fascism and then communism: our country has always been dedicated to opposing authoritarians, dispelling the dark magic of paranoia, and, yes, fighting for the equality of all people, including women oppressed by patriarchal regimes. If Ms. Stewart is right, then Christian nationalists are on the wrong side of truth, justice and the American Way. They will have to be out-voted. Democracy must prevail. Might as well start in 2019 with reforming the way the president is selected. Seems like good timing given that several dozen people are announcing they want to be president. They should all say publicly that they do not want to win without campaigning nationally to win the national popular vote in order to become president. The rules of the game have to be changed. “Born in Philadelphia in mid-August 1787, when most delegates to the Constitutional Convention were eager to escape the heat and humidity and go home, it was the fruit of a compromise between the two warring factions at the convention: those who wished to revise the Articles of Confederation and retain sovereignty in the states, and those who wished to replace the articles by shifting sovereignty to a fully empowered national government. In other words, if states agree to give there electoral votes to the winner of the national popular vote, we could finally be free from a system that no one really wanted in the first place. “For most of the twentieth century, American parties were ideological ‘big tents’ each encompassing diverse constituencies and a wide range of political views,” Levitsky and Ziblatt say on page 168 of “How Democracies Die.” They then assert that the Democratic embrace of the Civil Rights Movement collapsed the big tent. Next, immigrants supported the Democrats, and evangelists supported the Republicans. The result was two tinier tents, one for each party, and each with their own separate audiences. The point of view here disturbs me. The parties, like sellers in a market, position themselves to win elections like businesses want to win market share. The principal reason that the two parties re-aligned since the 1960s is that the presidential selection system makes the national vote irrelevant. If candidates knew they had to win the national vote in order to become president, then Republican nominees could not have been so willingly insensitive to the desires of black people and immigrants. Nor could Democratic nominees have resisted the concerns of evangelicals. The parties would have needed to create coalitions that could win national majorities, especially in close elections, as opposed to carrying a handful of swing states. Immigrants did not inevitably support Democrats, and African-Americans famously had long seen the Republicans as the party of Lincoln, the Great Emancipator. These groups did not choose parties so much as the parties chose them or left them. For Republicans, getting the immigrant vote would not help carry California, and the black vote in the old Confederacy could not beat the white vote. For Democrats, the evangelical vote in the Rust Belt, while huge, could not overcome the labor vote. If the national vote mattered, a different calculus would have prevailed. Both parties would have had motivation to build big tents.